Happy Year of the Pig! Today, China celebrates the start of the Lunar New Year. This is a huge holiday in China--the biggest, actually. Schools are closed for two or three weeks, and traffic in Shanghai is very light. If you want to hear more about what it's like to live in Shanghai during Chinese New Year, I've posted lots of photos, information, and two videos to my MrsReaderPants FaceBook page. Congratulations to Amanda from Virginia Beach, VA for winning last week's New Release Spotlight giveaway! Amanda chose A Curse So Dark and Lonely by Brigid Kemmerer as her prize. I've got another NRS giveaway this week, so don't forget to enter at the bottom of the post! Sixteen-year-old Bri wants to be one of the greatest rappers of all time. As the daughter of an underground rap legend who died before he hit big, she's got massive shoes to fill. But when her mom loses her job, food banks and shut-off notices become as much a part of her life as beats and rhymes. With homelessness staring her family down, Bri no longer just wants to make it -- she has to make it. Natalia Pena has already waned. So why does she love her little brother with such ferocity that, when he's kidnapped by a Big Brother-esque corporation, she'll do anything to get him back? Companion duology to: His Fair Assassin. When Sybella discovers there is another trained assassin from St. Mortain's convent deep undercover in the French court, she must use every skill in her arsenal to navigate the deadly royal politics and find her sister-in-arms before her time--and that of the newly crowned queen--runs out. Told in alternating voices. This graphic novel is based on Lowry's The Giver and is a must in all middle school libraries. Pairs perfectly with Telgemeier's Babysitters Club graphic novels! Imagine Hansel and Gretel's story from their teacher's point of view, when Gretel submits her report of, "What I Did in the Holidays, and Why Hansel's Jacket Is So Tight." Learn the story of how Rumpelstiltskin was used by a greedy girl who wanted to marry a prince in "Straw into Gold." Find out what was really underneath all those mattresses the unlucky princess had to sleep on in "The Prince and the Problem." This is the one with six starred reviews! Carter Jones is astonished early one morning when he finds a real English butler, bowler hat and all, on the doorstep--one who stays to help the Jones family, which is a little bit broken. In addition to figuring out middle school, Carter has to adjust to the unwelcome presence of this new know-it-all adult in his life and navigate the butler's notions of decorum. And ultimately, when his burden of grief and anger from the past can no longer be ignored, Carter learns that a burden becomes lighter when it is shared. Debut author! Twelve-year-old Ruby Moon Hayes does not want her new classmates to ask about her father. She does not want them to know her mother has been arrested. And she definitely does not want to make any friends. Ruby just wants to stay as silent and invisible as a new moon in the frozen sky. She and her mother won't be staying long in Vermont anyway, and then things can go back to the way they were before everything went wrong. But keeping to herself isn't easy when Ahmad Saleem, a Syrian refugee, decides he's her new best friend. Or when she meets "the Bird Lady," a recluse named Abigail who lives in a ramshackle shed near Ruby's house. Life is harsh in Chennai's teeming streets, so when runaway sisters Viji and Rukku arrive, their prospects look grim. Very quickly, eleven-year-old Viji discovers how vulnerable they are in this uncaring, dangerous world. Fortunately, the girls find shelter--and friendship--on an abandoned bridge. With two homeless boys, Muthi and Arul, the group forms a family of sorts. Seventh grader Jordan Banks loves nothing more than drawing cartoons about his life. But instead of sending him to the art school of his dreams, his parents enroll him in a prestigious private school known for its academics, where Jordan is one of the few kids of color in his entire grade. As he makes the daily trip from his Washington Heights apartment to the upscale Riverdale Academy Day School, Jordan soon finds himself torn between two worlds--and not really fitting into either one. Sequel to: Mez's Magic; included here because of multiple starred reviews. Caldera always existed in harmony between the creatures who walk by day and those who walk by night--until an ancient evil awakened. In the year since the shadowwalkers' narrow escape from the Ant Queen, the ants' destruction has only spread. Gogi, a shadowwalker monkey still learning to wield his fire powers, embarks on a quest with his friends--including a healing bat, an invisible panther, and a tree frog who controls the winds--for a powerful object that can harness the magic of the eclipse to defeat the Ant Queen. Note that there are TWO Hedy Lamarr books coming out this week! See the READALIKES below for the second title. This picture book tells the story of the pioneering scientific work and inspiring courage of Hedy Lamarr, the famous Hollywood actress who fought against old-fashioned parents, a domineering husband, prejudice, and stereotypes to become an accomplished inventor whose work helped pave the way for many of the communications technologies we enjoy today. Princess Puffybottom has the perfect life - her subjects serve her delicious meals, clean up her 'delicate matters' and wait on her hand and foot. Life is good...until Darryl arrives. Princess Puffybottom thinks he's disgusting, horrid and a true animal. Though she tries everything in her power to banish him (including hypnosis, trickery and even sabotage), it looks like this puppy is here to stay. Fast Enough combines an imagined story of Bessie Stringfield as a young girl with historical facts about Bessie as an adult. Bessie Stringfield went on to become the first African-American woman to travel solo across the United States on a motorcycle. Not only was she fast, but she was a true adventurer, daring to ride to places unsafe for African Americans in the 1930s and '40s. Under the sea, fish do what fish do: Seahorse hides, Pufferfish puffs up, Parrotfish crunches coral, and Crab...bakes cakes? Scallop swims, Dolphin blows bubbles, and...Crab bakes cakes. Brings to life a not too distant history of immigration to Ellis Island. When it's time for nine-year-old Gittel and her mother to leave their homeland behind and go to America for the promise of a new life, a health inspection stops any chance of Gittel's mother joining her daughter on the voyage. Knowing she may never see her mother again, Gittel must find the courage within herself to leave her family behind. Can't wait for On the Come Up by Angie Thomas! 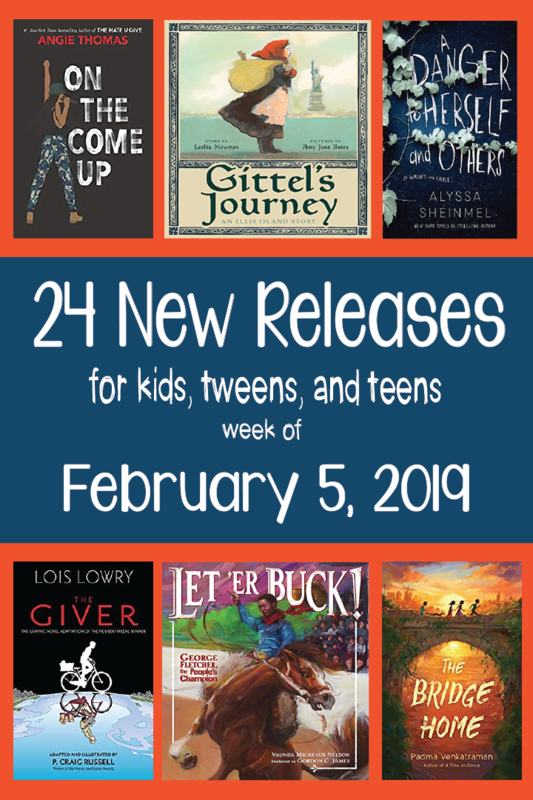 What a big week for books! I am putting many of these titles on order for my middle school library. Thank you for the elementary titles. I love reading your reviews and about your experiences in China but as an elementary school librarian the titles you highlight are often beyond my students. There are so many great options this week. I will be putting together an order. Glad you found some good ones this week! I have been trying to spotlight the younger titles a bit more equally, so it makes me smile that you noticed! OOOOHHH! 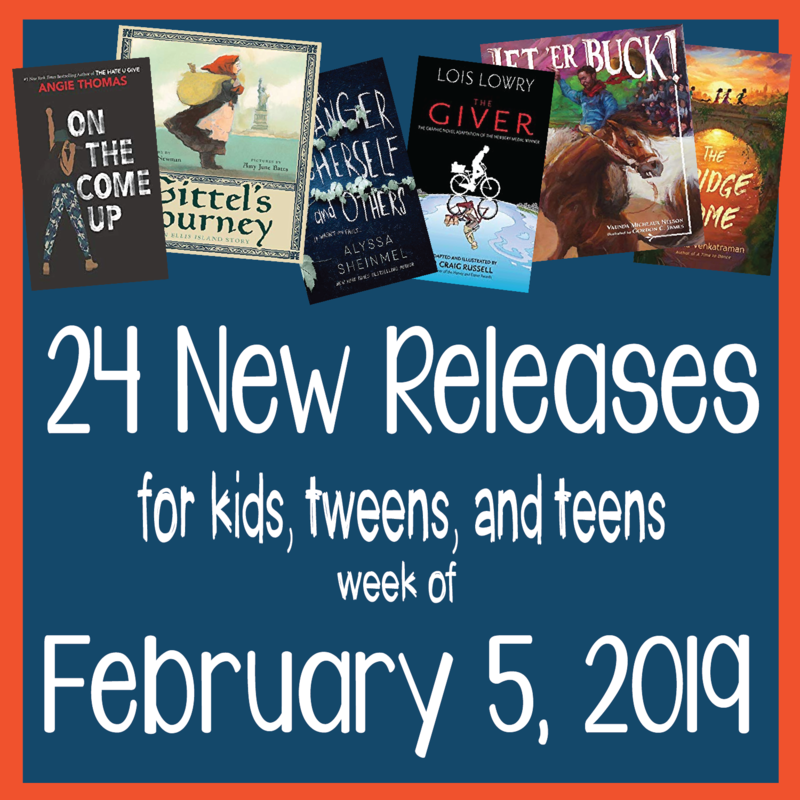 Some truly great new titles released this week! I know, right! I have a certain list of tasks to do each day of the week to ensure I post my NRS lists every Tuesday. Wedensdays are my day to compile a list of as many titles as I can find releasing the next week. When I started this list last Wednesday, I had yet another reason to be thankful for my Chinese New Year break. The original list had 54 different titles! Lots of great books this week. I'm looking forward to reading the GN adaptation of The Giver and see how it compares to the novel. I am really excited for that one, too! I'm in an international school where English is not the native language of most of my students. We have class sets of The Giver, and the graphic novel version will help students who struggle to read it with their class. My same thought. Our 8th graders read it each year, but a graphic novel could be perfect for those who struggle in reading or just a great addition to show from a document camera for all to enjoy. I want to read Courting Darkness. I have loved the nun assassins series and now a new book set in the same world! Yay! What a great list! I love to see the diversity and the empowered women. I'm so looking forward to reading: Pay Attention, Carter Jones (Gary D. Schmidt). Our little school in northern California has more and more students from dysfunctional families and I think this could be the perfect book for them and others to related to.